How many hours a day do you really watch TV? If you’re like us, your TV is probably on when you’re at home. 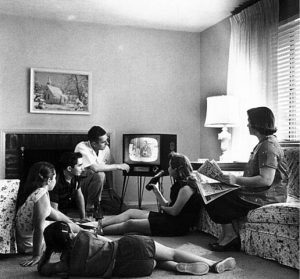 In fact, the average American watches more than 5 hours of television each day. But we’re not always watching, are we? The TV is on in the background while we’re cooing meals, cleaning the house, and getting the kids ready for school. Because we’re always thinking about home energy performance, here are three quick tips for TV energy efficiency. You can take advantage of these today and start enjoying your home entertainment without the high electricity bills. Is bigger better? As televisions have become larger, it makes sense that they are consuming more power when they’re in use. But most new TVs – and nearly every other piece of electronics equipment in our homes – also draw power when they’re not in use. Standby mode is the culprit here. This is a “power saving” feature that draws just enough electrical current to let the TV jump to life at the touch of a button. But it only saves power relative to the TV being in use. According to the utility company Florida Power & Light, “a new 50-inch flat screen TV uses from $23-$54 of electricity a year, with LED TVs using the least and older plasma models using the most.” Wow! Skip the power save mode and turn the TV completely off. You can use an energy efficient power strip to manage your TV, set top box, DVD player, and home theatre system. Turning everything completely off when you leave the house not only saves wear and tear on your expensive electronics, it saves money on your electricity bill. ENERGY STAR certified televisions are on average, over 25 percent more energy efficient than conventional models, saving energy in all usage modes: sleep, idle, and on. A home equipped with TVs, a Blu-Ray player, a compact audio system, and a home-theatre-in-a-box that have earned the ENERGY STAR, can save more than $200 over the life of the products. $200 more in our pockets sounds like a great deal! You can search the Energy Star website for certified televisions here. Knowledge saves power! Understanding your TV’s energy usage is easy, and it can help you save money on your electricity bills each month. To find out how much electricity your TV draws, look for the manufacturer’s technical specifications in your user manual, on the rear or bottom panel of the TV, or on the manufacturer’s website. You’re looking for the number of watts the TV requires. The present Energy Star specifications for televisions require that an Energy Star certified television “consume no more than one (1.0) watt while in Standby-Passive Mode” and “On Mode power requirements vary according to screen area.” Bigger TVs will consume more electricity, so a smaller number is definitely better here. Alternatively, you can use an electricity usage meter such as a Kill A Watt to determine your TV’s exact electricity usage. Electricity usage meters simply count the watts your equipment and appliances use and display them to you on a built-in screen. This gives you an exact measurement of your electricity consumption. With a little research and record keeping, you can understand and control the electricity your television, and all of your home entertainment system, is consuming. When you’re saving money on those bills, you can watch without worrying. Pass the popcorn! Want more tips like this? Sign up for our home energy performance newsletter. You’ll also get discounts from our partners, and ideas to make your home less expensive to operate, more comfortable to live in, and healthier for you and your family. It’s free! Next PostNext Is your home ready for fall weather?